In spite of the holidays often being fraught with stress and spending, along with an onslaught of social commitments, this time of year usually conjures warm and happy thoughts. 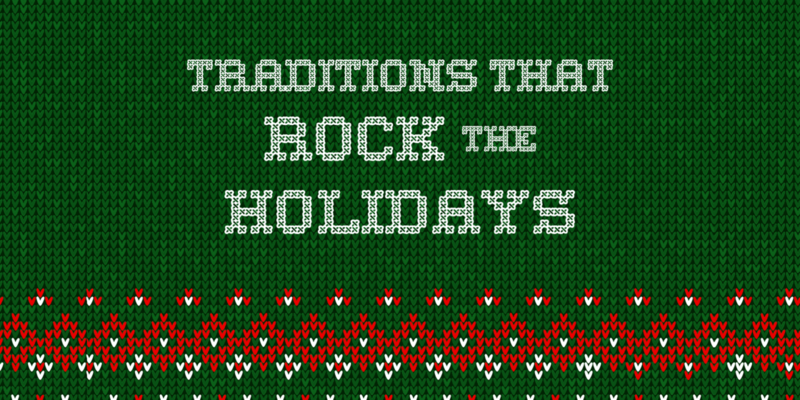 Those feel-good moments come from the traditions that families and friends develop and build on over the years. Annual holiday traditions are tremendously important, according to David J. Raznick, clinical psychologist and founder of Carroll Counseling Center, with offices in Mt. Airy and Eldersburg. There is also a rich sense of history in traditions that are handed down year after year. “Stories are told which tell us more about ourselves. Traditions give us important insight into personal identity and offer stability in life,” Raznick said. Amber Farran, who lives with her husband, Joseph, in New Windsor, has celebrated Christmas Eve with her parents, grandparents, aunts, uncles and cousins ever since she can remember. They gather each year on the Nevius family farm near Manchester for dinner and a gift exchange. Then the holiday fun continues with skits and goofy pictures. For the past 10 years, Farran’s cousin and her cousin’s sister have performed a show of original skits, which are met with laughter and vigorous applause. “The skits are always hilarious,” said Farran. “Sometimes the skits re-enact funny things that people in the family have done, sometimes they are favorite movie scenes, and sometimes they come up with a commercial for a product,” said Farran. One year, Farran’s cousin showed her spoof of TV infomercials: a commercial for a salt scrub product for feet, and followed that with a foot scrub for family members. 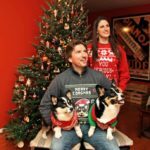 Another favorite Farran husband-and-wife tradition is the “awkward family photo.” In one version, Amber and Joseph are seated, holding two family dogs and intentionally looking away from the camera. 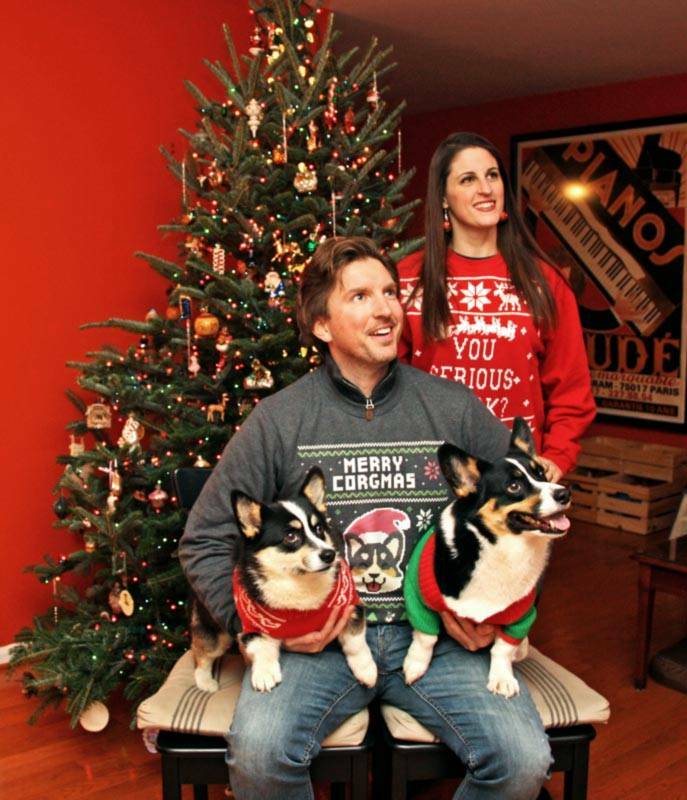 “My husband and I try not to take ourselves too seriously. We can be goofy. We also like to make our relatives laugh by sending them the photo either through the mail or digitally,” said Farran. And the photos seem to get more “awkward” every year, she said. Lynn Davis, executive director of the Carroll County Youth Service Bureau, has celebrated Christmas over the years with both neighborhood and personal family traditions. While raising her family, the holiday fun started early in December with a tradition she, her children and families from the neighborhood celebrated. When they were very young, the neighborhood kids did crafts and enjoyed a party. As the children grew, the neighbors celebrated with an “Amazing Christmas Race” that was held on the last day of school before winter break. The annual event was held for about 20 years, with children racing around the neighborhood. They jumped on a trampoline to their hearts’ content and threw empty wrapped boxes into a large rain barrel, competing to see which team could score the most baskets. Parents watched and enjoyed. As the kids grew too old for crafts and the Christmas race, the neighbors continued the annual tradition with a gift exchange. For the last five years or so, they added a contingency to the gift exchange. Each year, they chose a letter, such as O for ornament, J for joy or some other Christmas-themed letter. All the types of gifts started with the letter chosen for that year. Examples from the O years were an omelet maker, a case of Otterbein cookies, and herb-infused olive oil. “The present swap was executed in typical ‘Yankee swap’ fashion,” said Lynn Davis. “Using two decks of cards, one card is given to each participant. The master deck cards are called one at a time. When your card is called, you may pick a wrapped gift or take the gift of your choosing from someone else. Going through the deck twice allows for everyone to see all the gifts, strategize and hopefully end up with their favorite items,” she said. 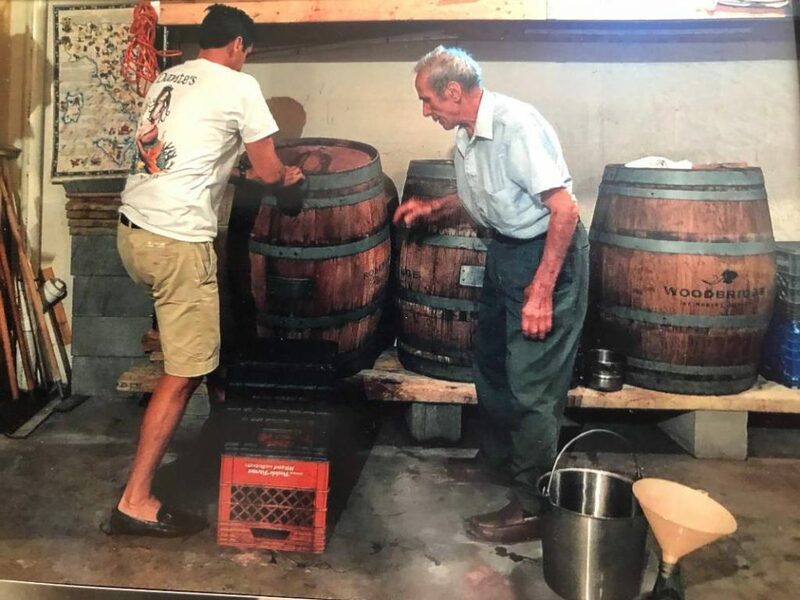 Dante Liberatore, who co-owns Liberatore’s Ristorante & Catering with his brothers, loves to share the story of his family’s tradition of making homemade wine and serving it for Christmas dinner at his parents’ home in Finksburg. About 20 to 25 family members gather with his mom on Christmas day, with fond memories of the family patriarch, who passed away in 2017. The wine-making starts months before Christmas when the family grapes from California. On a Sunday in October, his brothers, children and hometown friends gather to crush the grapes. Then the wine is bottled and allowed to ferment until Christmas, when the family opens bottles and samples their creation. The bottle opening is always suspenseful, as the family wonders if this year’s quality will be as good as previous versions. Liberatore said the family has never been disappointed. 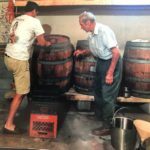 “From the very first sip, our fresh wine tradition unites every generation of our family seated at the dinner table,” he said. “Wine is a dinner staple,” said Liberatore. “On a deeper level, our own wine gives us pride and a sense of family warmth and closeness. Through making and serving this very special wine, we honor our Italian ancestors,” he said. Westminster resident Vicki Weiland and her daughter, Kara Davis of Eldersburg, created a family holiday volunteering tradition that has spanned three generations and now includes the grandchildren. The family prepares homemade meals to distribute at the county cold weather shelter, which serves Carroll’s homeless population. During the weeks preceding Christmas day at the shelter, Weiland’s five grandchildren, ranging in age from 3 to 9, gather in her home to decorate “to-go” bags for the shelter. The children create hand-drawn trees, gingerbread men and candy canes. The bags are then filled with nonperishable snacks and water, a distributed to shelter clients. “My grandchildren appreciate the value of giving, and how it feels to show someone else empathy and compassion,” said Weiland. Volunteers must be over 18 to enter the shelter to work with residents, so her grandchildren make their contribution in advance at home with her. Lynn Rosenthal remembers her father, William Cuddy, who passed away almost 25 year ago, as the rock of her family and the reason she is who she is today. 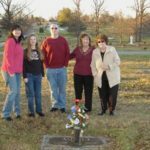 Her father’s memory is being passed down through four generations with an annual holiday visit to his grave. This family tradition includes placing a small artificial tree — decorated with battery-operated lights and 33 small round balls — on “Poppy’s” grave site at Parkwood cemetery. Written on the balls are the names of Rosenthal’s mother, Elizabeth, as well as six children, 12 grandchildren and 14 great-grandchildren. 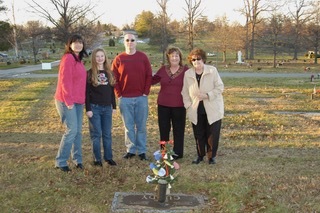 They make this visit on Christmas Eve, with the family gathering at the grave. The tradition started shortly after he passed away, and the family has not missed a year since.